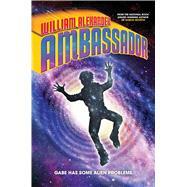 Gabe Fuentes is in for the ride of his life when he becomes Earth’s ambassador to the galaxy in this otherworldly adventure from the National Book Award–winning author of Goblin Secrets. Back home, Gabe discovers that his undocumented parents are in danger of being deported. Can Gabe survive long enough to solve two sets of “alien” problems? He runs for his life, through Minneapolis and outer space, in this fast-paced adventure from a National Book Award–winning author.